After a lot of discussion, looking at various maps and flight schedules and testing the patience of our travel agent, we have finally come up with the main itinerary as on the map below. 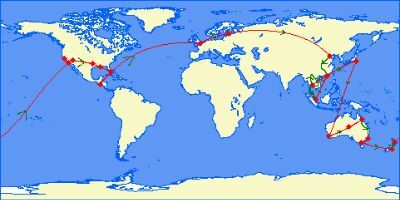 The red lines indicate our flights (around 18) and the green lines show where we are going overland. 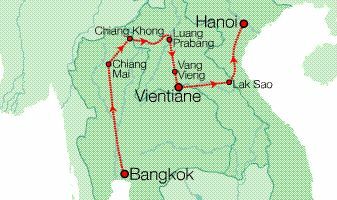 As you’ll see, our route (starting from London) includes China, Hong Kong, Thailand, Laos, Vietnam, Cambodia, Malaysia, Singapore, Australia, New Zealand, United States, Guatemala, Belize and Mexico - all in 12 months. We’re also going to stopover for a couple of days in Helsinki and Tokyo because, well, we can! The maps below will give you a better idea of where we are planning on going within each country and region. Although we are not specifying exactly how long we may stay in each country, we have divided the trip into 3 parts - China & South East Asia, Australia & New Zealand, North & Central America - each around 4 months long. 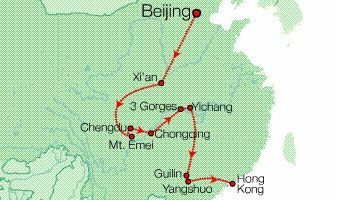 This is the route we are taking on our 3 week tour of China with Intrepid Travel, following a couple of nights in Helsinki en route to Beijing. 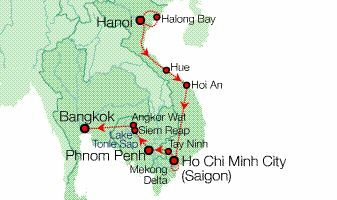 Then down from Hanoi to Ho Chi Minh Cit, probably using the reunification express railway line down the east coast, up through to Cambodia to the temples at Anghor Wat and then back to Bangkok. 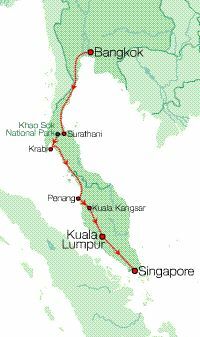 We'll probably follow a route similar to this one - there are good bus and rail links down the Malaysian peninsular. We are aiming to stay on Koh Tao (Turtle Island) which is close to Koh Samui on the east coat of Thailand. This is supposed to be an excellent place to learn to scuba dive. We'll fly into to Perth and possibly work on an organic farm in western Australia for a couple of weeks and then fly to Alice Springs to explore the 'red centre'. Then it's overland from Cairns to Sydney, enjoying the east coast, and finally a quick hop to Melbourne. We'll fly into Christchurch and explore the South Island before enjoying the North Island and flying to the USA from Auckland. We'll then fly back to London from Mexico City, absolutely exhausted! n.b. the green maps are the copyright of Intrepid Travel, the rest are copyright of Lonely Planet.